Gen Ham is commander of the US Africa Command (Africom) which, from its headquarters in Germany, co-ordinates US military activity across the continent. This includes direct action, varying from the use of drones against al-Shabab Islamists in Somalia to the training of African armies in various countries. The 100-strong US special forces contingent assisting in the hunt for the Ugandan rebel Joseph Kony also comes under Gen Ham's command. Speaking in Washington, Gen Ham highlighted what he called three of the "most dangerous" groups - AQIM, Boko Haram and al-Shabab. He said these groups were not monolithic, and that not all followed an international jihadist agenda. But he said what was most worrying was that the most radical elements among them were co-ordinating and synchronising their efforts. "Most notably I would say that the linkages between AQIM and Boko Haram are probably the most worrisome in terms of the indications we have that they are likely sharing funds, training and explosive materials that can be quite dangerous," he said. Gen Ham said AQIM was "an organisation of growing concern", particularly in relation to the situation in Mali. Earlier this year, there was a military coup in Mali followed by separatist ethnic Tuaregs and Islamist groups seizing control of the north. The Africom commander said AQIM now had "a safe haven in a large portion of Mali and is operating essentially unconstrained". Some of the connections between al-Qaeda and African-based jihadist groups have been known before. But there has been a question mark over whether there is a direct, operational link, as Gen Ham says. In the case of Boko Haram, the group's leader, Abubakar Shekau, has declared the link and the Nigerian government also asserts it. The problem lies in the fact that it may be in the political interests of Abuja to exaggerate such a link to get US and western support. 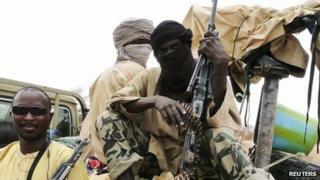 In a similar way, it may also be in the interests of Boko Haram to play up its affinity with al-Qaeda because it hopes that will lead to the kind of support it wishes to gather. The reality, however, may be that the real driving forces behind Boko Haram are inequality and poverty in northern Nigeria; a historic grudge between the Nigerian north and south; and an underequipped and corrupt police force. These issues may be just as important as any links between African jihadists and al-Qaeda.